Passed away peacefully on 29.3.2019. Loving Husband of Violet (dec). Beloved Brother of Joy and Elsie. Father of Kathleen (dec), Lynda (dec) and Tony. Father-in-law of Jodie. Grandfather to Peta, Jesse, Cara, Maurie, Jorden, Cayden and Sam. Great-Grandfather to Michelle, Melissa, Nathan and Caleb. 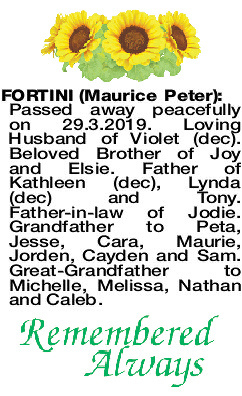 The Funeral Service for Mr Maurice Fortini of Beaconsfield, formerly of Wickepin and Bibra Lake will be held in Our Lady of Mount Carmel Catholic Church, 82 Collick St HILTON commencing at 2.30pm on MONDAY (08.04.2019). The Cortege will leave the Church at the conclusion of the Service and arrive at the Main Entrance of FREMANTLE Cemetery, Carrington St Palmyra at 3.45pm for a Burial Service. Please assemble at Samson Pavilion at 3.35pm. The things we feel most deeply are the hardest things to say. But God knows we'll miss you in a very special way. Love always Tony, Jodie, Jorden, Cayden and Sam. A farmer once sat upon a seat, tilling fields and raking wheat. Driving all those country miles, memories that made us smile. Resting now where no shadows fall, sleeping peacefully he awaits us all. 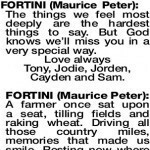 Rest In Peace Pop Cara, Nathan and Caleb. You were a big part of my life and will be missed greatly. My best and earliest memories were helping you on the farms. I couldn't have asked for a better Grandfather or mentor. Farewell for now. 'Til we meet again. Little Maury. 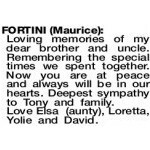 Dear brother-in-law of Tony and Yvonne. 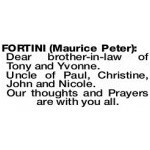 Uncle of Paul, Christine, John and Nicole. 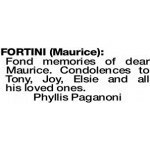 FORTINI MAURICE Dearest memories of Maurice. Brother of Joy. Uncle to Jim, Alf, Elena (dec), Diana, Valma, Rose and families. 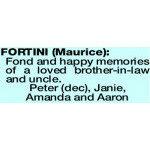 Loving memories of my dear brother and uncle. Remembering the special times we spent together. Now you are at peace and always will be in our hearts. 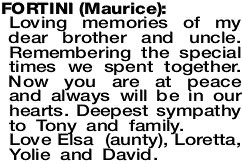 Deepest sympathy to Tony and family. Love Elsa (aunty), Loretta, Yolie and David. Pop, I'll never forget all the good times we had together and all the help and guidance you gave me. I think of you every day. Jesse. 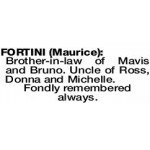 Brother-in-law of Mavis and Bruno. Uncle of Ross, Donna and Michelle. 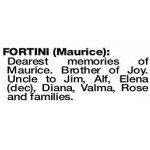 FORTINI MAURICE Fond and happy memories of a loved brother-in-law and uncle. 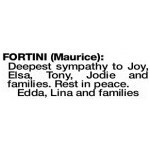 Deepest sympathy to Joy, Elsa, Tony, Jodie and families. Rest in peace. 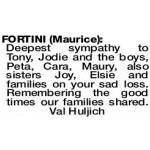 Deepest sympathy to Tony, Jodie, Joy, Elsie and grandchildren. 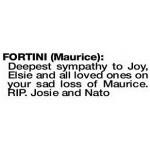 We will all miss you Maurice. It is a pleasure knowing you. 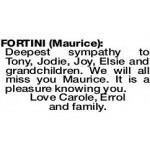 Love Carole, Errol and family. 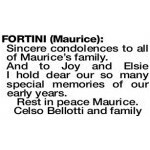 Fond memories of dear Maurice. 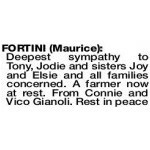 Condolences to Tony, Joy, Elsie and all his loved ones. 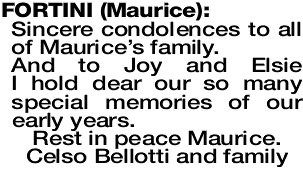 Sincere condolences to all of Maurice's family. And to Joy and Elsie I hold dear our so many special memories of our early years.